Do not Support Audio & Video output. We are committed to resolve all issues in a friendly and satisfactory manner. 8 Pin to 30 Pin Converter Adapter Adaptor. iPhone 5s, iPhone 5c, iPhone 5. High quality 8 pin to 30 pin Adapter. Allows you to use your old 30 pin accessories to devices featuring the 8 pin. Works with compatible iPhone, iPad or iPod models. If you have an older iPhone charger but a newer iPhone, you don't necessarily need to get a brand new iPhone lightning cable when all you need to do is grab an iPhone 4 to iPhone 5 charger adapter. Those older, 30-pin adapters worked for iPhones version 4 and older. With a simple iPhone adapter you can update that technology to work with the newer generations of iPhone, and there are plenty of these types of adapters to choose from on eBay. How does the iPhone 4 to iPhone 5 adapter work? The iPhone 4 to iPhone 5 charger adapter is exceptionally simple. All you need to do is take your wider, 30-pin charging cable and attach it to the matching side of the adapter by pressing the charging adapter and the iPhone 4 gently together. 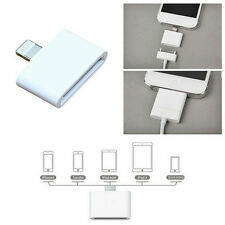 Your charging cable is now ready to use by plugging the 8-pin side into your iPhone 5, effectively connecting the two iPhones. Why would you want an iPhone charger adapter?An iPhone 4 to iPhone 5 charger adapter makes it so that you can hook your old iPhone 4 and 5 together in order to transfer data. It also makes it so that you can charge your device if you only have a certain type of charger instead of the one that's needed for your iPhone. For instance, if you don't have your iPhone 4's original charger, you can convert it to the type of charging port you need with the appropriate adapter. Can you use a 30-pin adapter for other iPhone generations? Are there different styles of iPhone charger adapters? Yes, there are a handful of different styles to choose from. You can take your pick of short, stocky adapters that will do the job nice and easy, or you could grab an extended adapter that connects via a cable.